To show just how thankful I am of all of my supporters and followers I have created this Thanksgiving writing freebie. 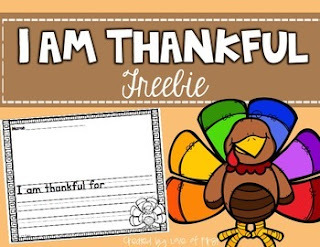 -Students finish the sentence with the starter "I am thankful for"
-Students trace over the sentence starter "I am thankful for" and continue the sentence. -Blank writing lines so that you can use this freebie however you'd like! All pages include a blank space above the writing lines where students can illustrate. I hope that you enjoy this freebie!